Betboro is acutely aware of the significance of offering mobile users dedicated apps. 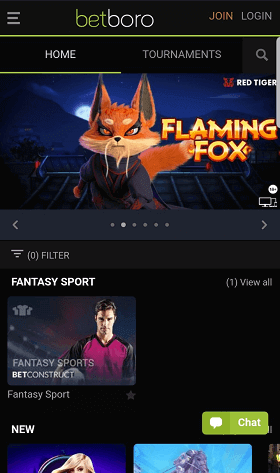 As such, they have made available to Android users a dedicated mobile app for Android devices that provides that ability to place bets on a broad range of sports. It also allows for the testing of skills at poker, live casino games, online casino, fantasy sports and FinBet Section. This will allow for the experiencing of exciting gameplay that goes hand in hand with sports betting. To ensure a trouble-free experience in the downloading of the Android mobile app for Betboro, we have included below step-by-step instructions. This relates how to download the app for those preferring to access Betboro via their Android device. It should be noted that the app for Android is not offered via the Google Play store and is only available directly via the Betboro website. Visit the Betboro website using your preferred mobile web browser with your Android device. Once the Betboro website loads, located the “download for Android” button located in the “promotions/payments” section. Once you click the “download for Android” button, a pop up will open asking you to accept the apk file. Clicking “OK” to accept the .apk file will begin the download process. This may result in a message alerting you to its installation being blocked. In the event this message appears, simply go to ‘Settings‘ and select “unknown sources”. Activate this to accept the downloading of the .apk file and installation will continue. Upon completion, you only need to locate the app on your Android device to begin using all its features or to register a new account. Existing users need just to enter current login details. As it has to its Android users, Betboro caters to iOS users with an equally high-quality dedicated iOS mobile app. It features the same high standards inequality and provides access to all its betting markets including its live casino, online casino, sportsbook, poker, finbet and fantasy sports. The main difference to the Android app is the iOS app is available via the Apple App Store saving the need first to download a .apk file. As with the Android app, we have included a step-by-step guide for installations to assist you in your desire to begin using all the features Betboro offers. Visit the Betboro website using your mobile browser. Then navigate to the “Download App” located at the bottom of the site. Clicking it will redirect you to the Apple app store. Select “Get” to commence the downloading of the Betboro mobile app for iOS. The Betboro app will then begin installing on your iOS device. Once completed, simply open the app then log in using existing details, or, if new to Betboro, select the “register” button to register a new account. In the event you prefer not to download either of the dedicated mobile apps, Betboro has ensured you the opportunity to enjoy all its features via a mobile version via your mobile browser. This affords you the luxury of not having to download additional software but still can access and get the most out of your mobile Betboro experience. All that is needed is merely to open your mobile browser of choice and search for Betboro. Then log in using existing login details, or if not yet a member at Betboro, register a new account. The mobile version has been designed to feature all betting markets and betting options along with its other features that define the quality that is experienced at Betboro. Thus, you are free to place bets on a comprehensive selection of sports, casino games, fantasy sports or online poker. As is a respected upcoming sportsbook focused towards not only meeting but exceeding the expectations of punters. As such, Betboro has implemented a beautiful collection of features designed to increase your online betting excitement while using your mobile. To highlight what Betboro has in store for you when you chose to visit their mobile version or download one of their apps, we have listed those features we feel most valuable below. The Betboro match centre is rather a unique feature that is designed as a time-saving feature. It affords punters the ability to quickly locate upcoming matches including those completed earlier in the day, those live and daily pre-matches. This feature is offered on a wide variety of sports including Football, Basketball, Tennis, Ice Hockey and multiple others. As a measure of convenience, it includes currently posted odds and various other relevant match information to assist punters in making strategic decisions. Live betting is an exciting part of any sports punters betting experience, and Betboro has implemented extensive live betting options so that punters have the luxury to place bets while a sports event is underway without the need for data consuming restrictions used via live streaming. Those choices encompass all those sports deemed most favourite such as Football, Basketball and Cricket, but also several not as popular such as Volleyball and Handball. It features up-to-date statistics and odds to ensure you stay updated in real time. As with other mobile-friendly sportsbooks, Betboro allows the option for you to determine when the best time for cashing in your bet through early cash out feature. This feature is active even while matches or games are underway and gives you the power to manage active bets when appearing no longer to be deemed favourable. This feature is available for a broad spectrum of sports with scores, statistics and odds being updated continually. This is in place to ensure you are provided with the information needed to make informed decisions. One of the most useful features that make up those offered at BetBoro is its live streaming section. It allows you to directly watch your favourite team while having the ability to place bets directly via your mobile. Even more impressive is the fact that odds are real-time updated, and adding further value, live streamed sports events include valuable statistics to assist in making educated bets. While not the largest online sportsbook catering to betting enthusiasts, Betboro has arguably created a platform that offers superior quality and value in each of its mobile betting options. There is little doubt that the betting option most attractive is its sports. Due to its extensive list of available sports punters can place bets on 50 different sports making it one of the more comprehensive online. However, its fully functional online casino is equally impressive with an extensive range of casino categories to ensure all needs are catered to whether interest lies in slots, video poker, table games or even virtual betting. The Betboro sportsbook will quickly be seen by punters as extensive due to it offering one of the most extensive lists of available sports markets. This goes well beyond the more sought after sports such as Soccer, American football or Ice Hockey, but delves into virtually every other imaginable sport. That list includes Hurling, Floorball, MMA, NASCAR, Motorbikes, Darts, Curling to name a few and even includes special interest sports such as Speedway, Surfing, Rally and Pool. Furthering the broad range will see punters given TV and Movies as well as Political betting opportunities, all of which is neatly packaged for easy navigation and convenience. The mobile casino leaves little to yearn for and alone makes a justifiable reason for joining this upcoming bookmaker. This is due to its range of games equalling that of any bookmaker as it includes games from Pragmatic Play, NetEnt, Thunderkick, Microgaming, Red Tiger Gaming, ELK Studios, 1X2 Network, Casino Technology, Colossus Bets, NextGen Gaming and multiple others. Betboro also has chosen to implement a 100% casino match bonus valued at up to €100 for newly registered punters and makes navigation a simple process due to conveniently locatable gaming categories. Those include Progressive, Video Poker, Video Slots, Virtual Betting, Table Games, Casual Games, Classic Slots, Scratch Games and Live Dealer. To further enhance the overall navigational experience, categories such as New, Other Games and Popular Games have also been thoughtfully included. You even can search games by name using a search function within the casino. As Betboro offers both an Android dedicated mobile app, an iOS dedicated mobile app and a mobile version of its desktop site, understanding withholds more value can be dependent on a significant number of factors. While each is equal in its execution of quality and reliability, they both provide an equivalent player experience in so far as it’s betting options. This relates to its available sports and betting opportunities such as the casino, live dealer and virtual games. The same is correct about its other site features such as your ability to transact =deposits, request withdrawals and contact support services. The main difference lies in the downloading of the mobile apps versus accessing the site directly via a mobile browser, and ultimately, that becomes a personal preference. We have included a table to highlight several differences listing both the advantages and disadvantages of both. App will update frequently in order to remain up to date with statistics and odds. The compatibility of mobile devices may have been of concern in the past. However, today’s handheld devices are designed to operate flawlessly to deliver an uninterrupted smooth experienced derived as a result of the technological advances built into each. However, while that is the case with the overwhelming majority of smartphones, some may need to update the installed operating systems if using an older model. As a general rule, most will automatically alert to operating system updates. However, it is recommended verification that your device is operating with the latest release. As a measure of convenience, we have included a sampling of those devices known to be compatible with the Betboro mobile apps and the mobile version of its website. When referring to specific bonuses for mobile users, you will find that Betboro, as so many of today’s bookmakers do, not offering promotions specifically to its mobile bettors. However, this is a luxury that will see all promos, regardless of their nature, becoming available to all who take advantage of the full betting options and features within Betboro. This includes its welcoming bonuses to its promotions geared towards rewarding it loyal punters. The measure of a solid and player knowledgeable sportsbook is its understanding of the importance to cater to player banking preferences. This includes how that relates to available methods that often provide specifically to one geographical area versus globally. As such, Betboro has ensured it not only satisfies the most commonly accepted options such as major credit cards and popular web wallets but extends its available deposit and withdrawal methods to a variety of less conventional methods. Below, you will find a list of all offered options, their minimum and maximum deposit/withdrawal limits and the times taken in the processing of deposits and withdrawals. If I accept the Sportsbook Welcome Bonus, am I still eligible to take advantage of the 100% Casino Bonus? No. Unfortunately, as is standard practice amongst sportsbooks and other online gaming sites, only one welcome bonus is permitted. This applies not only to individual player accounts but extends to IP address, residential address and computers. Does Betboro features a FAQ section that is accessible via its mobile apps? Yes. Betboro has compiled an extensive collection of frequently asked questions to aid in their support of punters when in need of information about the Betboro website, mobile apps and betting features. As an added measure of assistance, the F.A.Q section has been itemised based on specific categories. What mobile browsers are compatible with the mobile site version? Virtually all mobile browsers are compatible and include popular ones such as Opera, Firefox, Safari and Google Chrome. If using a lesser known mobile browser, it is recommended that you verify if it is Chromium-based. If confirmed it is, then there is a high probability it will be fully compatible. If I install the Betboro iOS app, am I required to register a separate account, or will my current details allow me the ability to log in? No, you do not. In fact, it is imperative that you do not as opening a second account is not permitted and will result in both accounts being locked as a measure or security. This is due to restrictions placed on licensed bookmakers relating to money laundering. When claiming the Sportsbook welcome bonus, am I required to enter a special bonus code in to claim the offer? No, a bonus code is not needed to claim any of the bonuses featured with Betboro. You need only to visit the “bonus settings” and click “claim” to request your offer when making your initial deposit. Am I able to speak with the live dealers via the mobile app on my mobile? Absolutely! As with its desktop and mobile version sites, the Betboro Android and iOS apps allow you to communicate while enjoying any of the offered live dealer games. Am I able to contact support while logged in to either the iOS or Android mobile app? Yes. At the bottom of the screen, you will find a direct link to the live chat centre operated by Betboro. This is features on all versions irrespective of it being a desktop, mobile or mobile apps. Alternatively, you can email the support centre at support@betboro.com. The Betboro mobile apps, along with its mobile version more than provide a betting experience that is beyond approach. That applies not only to its overall design and implementation of its betting markets and features but to its selection of promotional and bonus offers. Adding to its overall delivered betting experience is an extensive selection of deposit and withdrawal methods, a 24-hour support team and extensive F.A.Q section. Collectively, they combine to offer a truly comprehensive experience equal in quality to more experienced and established bookmakers. As such, we are pleased to provide Betboro with a 9 out of 10 rating.